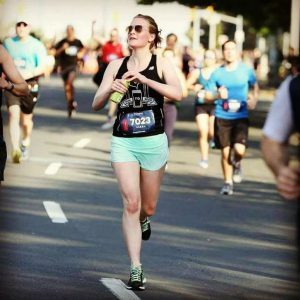 Sarah Power has been a member of the RunTOBeer club since May of this year. She joined the group less than 24 hours after landing in Toronto as a result of the group being featured in the Aer Lingus in-flight magazine. This will be her first Famous Canadian Beer Run and she’s most looking forward to the costumes and (as the Irish say) the ‘craic’ of event day! *What is the Brew Crew? The Brew Crew is a team of 25 very enthusiastic runners from RunTOBeer club. On run day the sole job of the Brew Crew is to amp up the fun at the Famous Canadian Beer Run! They’ll be out in costumes on the course, cheering you on and celebrating with you at the finish line. Trust us, you won’t be able to miss them!